I had an eye appointment for new glasses a couple of weeks ago and I let them talk me into getting the new digital progressive lenses. I am not the least bit happy with them. I am having a difficult time with close up work and I have to look out the top of the lenses for distance by tilting my head down. I guess it will be back to the eye doctor this week for some adjustments. I tried progressives before and wasn't happy with them. I should have known better. I can't stand it when I can't see well or have bleary vision with the glasses. Even with this handicap I was able to complete a couple of projects. Today I tatted my first Easter Egg. It is a pattern by Eileen Stafford. I enjoyed making it even though I didn't have all of the directions. I missed part of them when I copied the pattern but still it was fun. I used Lisbeth Thread Color Number 115. I do like working with this thread it is smooth and doesn't seem to have a lot of thread dust. I am going to count this as part of the 25 Motif Challenge. And just so you know I haven't been idle here is a picture of my design for the Design Tat class. I made several attempts before I finished this one and I still have an error. I was going to do six picots on the outer rings but as you can see I forgot what I was doing and only manage to get them on the first ring. So it will be off to make anther model for this one. 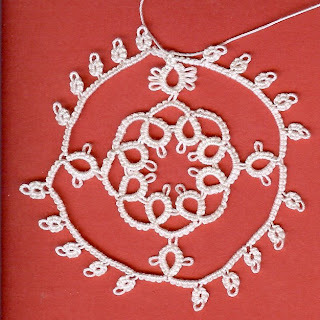 I have put aside the needle tatting as it has totally frustrated me. I don't know that I will ever conquer it. I will just have to be satisfied with the shuttle. The egg looks so 'springy'! Very nice. 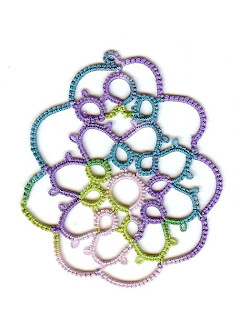 I have to laugh a little about the needle tatting - I, too, am a shuttle tatter and think it's easier, probably because I did it several years before I tried needle tatting - but most people find it easier to needle tat than shuttle. I'm with you, I'll stick to my shuttles! Hi I just came back over to invite you to my party!